The zygodactyl Piciformes comprise the Neotropic Galbulae (jacamars and puffbirds) and the Pici (barbets, toucans, honeyguides, woodpeckers and allies), which have a nearly worldwide distribution but do not occur in the Australian region and on Madagascar. In addition to a unique arrangement of the digital flexor tendons, piciform birds exhibit a derived morphology of the proximal phalanx of the major digit of the wing (Mayr et al. 2003; Manegold 2005). The Paleogene fossil record of piciform birds is still quite scanty. Most notably, all known specimens are from very small species, some of which are even smaller than the smallest extant Piciformes. A very poorly known species with possible piciform affinities is "Neanis" kistneri Feduccia, 1973, a zygodactyl bird from the Green River Formation. "N." kistneri was considered a piciform bird in the original description (Feduccia 1973) and was regarded as closely related to the Galbulae by Houde and Olson (1989). The latter authors also first recognized that it is not a congener of N. schucherti (see Sect. 16.10). The holotype of "N." kistneri was meanwhile transferred on a resin slab, so additional osteological details are visible. A specimen from the Green River Formation that was figured by Davis and Briggs (1998, Fig. 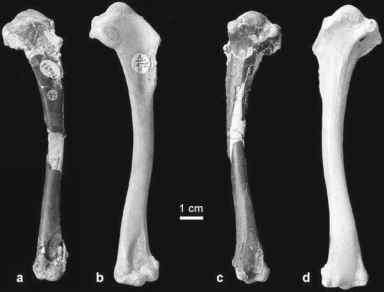 2B) probably belongs to the same group of birds (Weidig 2003; own observation). The feet of "N." kistneri exhibit a zygodactyl position and the troch-lea for the fourth toe bears a well-developed accessory trochlea. The tarsometatar-sus is shorter than that of the Zygodactylidae, and the procoracoid process of the coracoid is long and slender. However, despite some overall similarity to those of extant Galbulae, piciform affinities of "N." kistneri have not yet been well based, and better preserved specimens are needed to firmly establish the phylogenetic affinities of this species.